Although oral cancer may not get as much attention as some more widely-known types of cancer, that doesn’t mean it’s any less deadly. In fact, it is estimated that in the United States, oral cancer is responsible for killing one person every hour, every day. While it accounts for a relatively small percentage of all cancers, oral cancer is dangerous because it isn’t usually detected until it has reached an advanced stage. At that point, the odds aren’t great: only about 6 in 10 people will survive after five years of treatment. If there was a simple test that could give you an early warning about whether you’re likely to have this disease, would you take it? The good news is — there is! Since early detection has been shown to increase the survival rate of oral cancer to 80% or better, this test can truly save lives. And best of all, having an oral cancer screening is part of something you should be doing anyway: getting regular dental checkups. If you notice abnormal sores or color changes in the tissue of your mouth, lips and tongue, they may be a symptom of oral cancer — most, however, are completely benign. But sores or other unusual changes that haven’t gone away by themselves after 2-3 weeks should be examined. 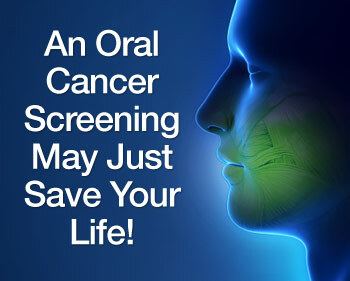 Remember, the only way to accurately diagnose oral cancer is through a laboratory report. Early diagnosis, aided by thorough screenings at your regular dental checkups, is one of the best defenses against oral cancer.